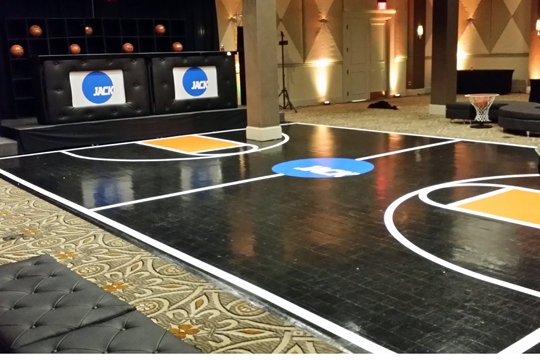 Custom Party Dance Floor Graphics - whether you are looking for a logo or want to create a custom game floor to look like a basketball court hockey rink, baseball diamond or game board, we can help! Talk of the Town, Rockville, MD 301-738-9500. Custom Party Floor / Dance Floor Graphic Designs and Dance Floor Covers - Why settle for a plain looking dance floor when we can help tie it into your party theme? Whether you are looking for a logo or want to create a custom floor to look like a basketball court, ice hockey rink, baseball diamond, or game board, we can help! Our dance floor vinyl decals are slip-resistent for the safety of your guests, and scuff-resistent to last throughout your party.